On the occasion of the upcoming Berlin Fashion Week our friends from Style.de met our co-founder Cathy Boom for an interview and chatted about her fashion week must-haves etc. Read her replies here (only in German). 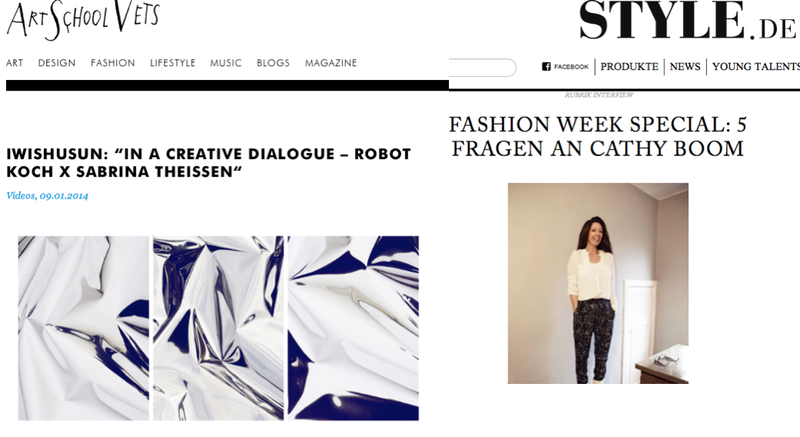 Also, The renowned German online magazine ArtSchoolVets featured our latest project “In a Creative Dialogue – Robot Koch x Sabrina Theissen for IWISHUSUN” - a cooperation including a track, three photos and a video which were created by two of our friends, the composer and music producer Robot Koch and the photographer Sabrina Theissen. Together they took a look at the topic of sight, which IWISHUSUN has dedicated its work to. Head over to ArtSchoolVets to read the entire article (only in German).